Uxbridge College student, James Hillier, has been honoured for his sporting achievements with the Panathlon’s top annual award for competitors in London and Essex. Panathlon is a charity that gives more than 17,500 young people with disabilities and special needs the opportunity to engage in competitive sport each year. James,16, was named the tenth winner of the Jack Petchey Outstanding Achievement award for his achievements with Panathlon. He competed with a group from his previous school, Ruislip High School, in events including Powerchair Slalom and beanbag throwing. Competitors in the slalom have to manoeuvre a high performance electric wheelchair through a set of obstacles as fast as possible and in the beanbag competition they have to hit a target. 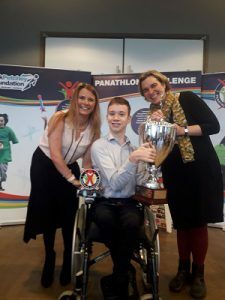 James’ prize was presented by Panathlon Ambassador and Paralympic swimming gold medalist Liz Johnson and Gemma Juma from the Jack Petchey Foundation at a ceremony which took place at John Lewis, Stratford City. James said : I’ll never forget that day. I never realised that I would win – I couldn’t believe it. My mum cried and my dad nearly cried too! I would like to thank everyone who came on the night and everyone who has supported me in doing sport. I would love to enter more competitions. Access to Further Education student James, who is quadriplegic and has cerebral palsy, also loves trampolining and has been part of the Brunel University wheelchair basketball club.